Located in the resort of Malia on the island of Crete, the Aristotelis Studios are 1.2km from the beach, 300m from Malia centre and 32km from Heraklion Airport.Aristotelis Studios are situated in the old town of Malia with restaurants, bars, shops and supermarkets all in easy reach. There is a swimming pool next to the complex which can be used by people staying at the property. Property facilities include reception, free Wi-Fi in public areas and parking. Studio facilities include bathroom, kitchenette, fridge, coffee and tea making facilities, safe (local charge), air conditioning (local charge) and balcony or terrace. 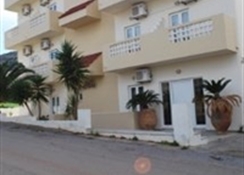 Address: Pavlos Melas 27, Malia,7007, Crete, Greece.